A professionally trained counsellor at the Marie Stopes Sexual Health Infoline in Timor-Leste (East Timor) is on the phone trying to explain to a teenage girl that if she gets a contraceptive implant in her arm, there is no way it could travel to her heart or brain and kill her. These sorts of myths are common as most women in South East Asia do not have access to the correct information about contraception and family planning – and that lack of knowledge is often fatal. Today is World Population Day, an annual event recognised by the UN which seeks to raise awareness about population issues. This year’s theme is about investing in young people, and with tens of thousands of young women and girls dying every single year due to complications related to pregnancy and childbirth, Marie Stopes International is highlighting the need to increase access to reproductive health services. In Timor-Leste, sixty-five percent of the population is under 25, and while there is a growing awareness of contraceptive choices, most have no access to sexual and reproductive education and services. Many women start their family at a very young age with one in 17 girls aged 15-19 having given birth. More distressingly, pregnancy is the leading cause of mortality among teenage girls in developing countries, while unsafe abortion is the third most common reason pregnant women die. We know that greater access to contraception could save the lives of thousands of young women and girls, as well as giving them a chance to finish their education and contribute to their communities. The situation is dire but there is a solution. Now is the time to invest in young people and make women – and girls – matter. Make Women Matter is a campaign started by Marie Stopes International that calls for global commitment to reproductive choice and rights to improve the lives of women and put an end to preventable maternal deaths. In 2000, the United Nations and world countries agreed on a set of eight ‘Millennium Development Goals’ to reduce poverty and inequality be 2015. The fifth goal is to reduce maternal deaths by 75% and achieve universal access to reproductive health. Of the eight goals, this is the most off track. So when the United Nations meets in September this year to decide on the next set of development goals, Marie Stopes International wants to remind decision makers to Make Women Matter. 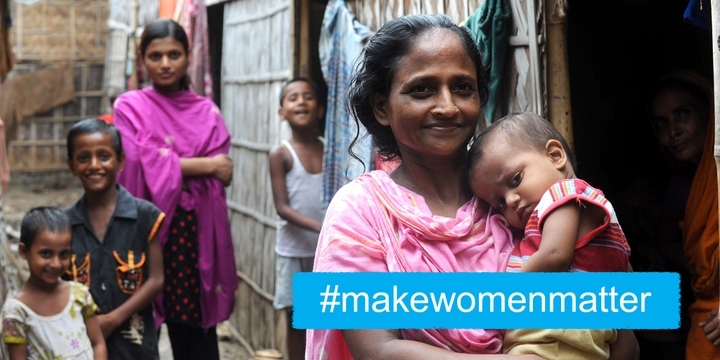 Join Marie Stopes in the Make Women Matter campaign to ensure girls, like those in Timor-Leste, have a brighter, more secure future. Enabling women and girls to access contraception helps prevent unwanted pregnancies, reduce unsafe abortion and limit needless maternal deaths. This entry was posted in Featured and tagged contraception, health, maternal health, world population day. Bookmark the permalink.